- Several published military history articles at www.militaryhistoryonline.com. a member of the Illinois militia. Captain Biggerstaff, and the formatting of this copy. This copy is posted here on my web page with the permission of Mr. Ford. For this, again, I am grateful to him. interpretations of these contents are solely my responsibility, for which I humbly apologize in advance. 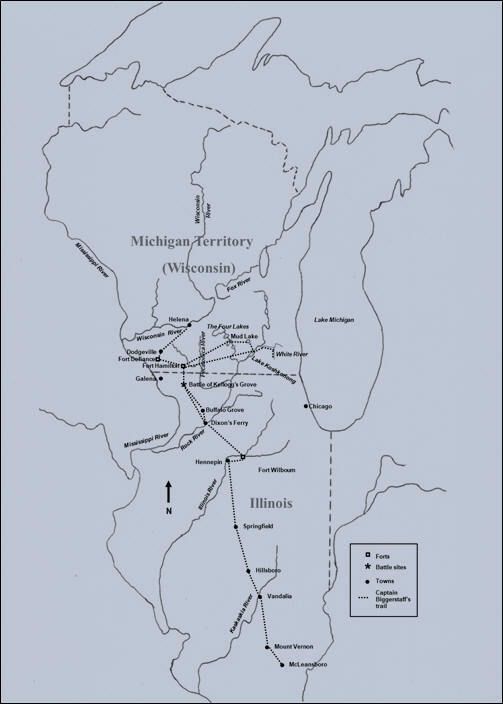 What follows is a transcription of Captain Ardin Biggerstaff’s 31 May to 25 August 1832 diary, which he kept during and detailing his service in the Black Hawk War as a member of the Illinois militia. The original diary consists of eight 2-sided approximately 7 ½” x 6” pages (totaling 16 pages), loosely bound together by a small thread. The first 10 pages contain brief daily entries of his adventures. At the end of the diary, after several blank pages, one of the final slips of paper lists birthdays of six apparent family members. Hand written in cursive using the Captain’s personal writing style (including no punctuation and somewhat creative, at least to today’s style, capitalizations), some of the diary’s wording is spelled phonetically, therefore, in several cases rather difficult to decipher with absolute accuracy and certainty. A photocopy of the original diary came into my possession from Captain Biggerstaff’s great-great-great grandson, Mr. James Ford, who found the original bound copy in his mother’s house. I am greatly honored and appreciative to Mr. Ford for choosing to send this copy to me. After reading the diary, I decided to take it upon myself to attempt to transcribe the contents for prosperity. With this said, I retain no copyrights of the following pages. All copyrights fully remain with James Ford and/or his designees. My sole contributions are the transcriptions, the rather meager rough map of the basic area covered in Captain Biggerstaff’s journey, the short biography of Captain Biggerstaff, and the formatting of this copy. capitalizations, and colloquialisms as they appear in the original copy. I did, however, take the liberty of adding correct spellings, at least the first time they appear, in brackets, as well as left spaces between each date’s entry. In addition, I included a few footnotes. All of these editions are simply meant to assist the reader in better understanding the Captain’s writings. A photocopy of each original page will proceed my transcription of that page. Please understand that these photocopies are photocopies of photocopies, so they are rather light and can be somewhat difficult to read on their own. Luckily, I was working off a PDF copy, which I was able to enlarge using my computer screen to better view and interpret. Nonetheless, some of the words were still rather difficult to decipher with full accuracy. Whenever this occurred, I made an educated guess taking the sentence or phrase of the word placement in consideration as well as like words or even cursive letters elsewhere in the diary. When this arose, I placed a [?] after the “transcribed” word. I can only hope that I translated the contents of Captain Biggerstaff’s diary correctly and did justice to his writings and memory. Any miss-readings or miss-interpretations of these contents are solely my responsibility, for which I humbly apologize in advance. “assumed” that, at least after the war, he was a farmer. He is buried in Concord Cemetery in McLeansboro. Soon after the Captain’s return home from the war, in 1833 he married Eliza Jane Lane Prince – Prince is the last name of Eliza’s second husband. Ardin and Eliza would have four children: Lewis, b. 1834; Mary Elizabeth (Mitchell), b. 1837; Lucy (Pierce), b. 1839; and Milo, b. unknown. Interestingly, Eliza is the daughter of Lieutenant Lewis Lane, the 1st Lieutenant of Captain Biggerstaff’s volunteer company during the war. Lewis Lane was 13 years older than Biggerstaff and reportedly fought in the War of 1812. One would ask why or how a young, 25 year-old farmer could become a captain over older volunteers, such as Lane. This can be easily be explained by the custom of the times of state militias throughout the entire country electing their own officers (below the rank of colonel), sergeants, and corporals, each volunteer having a vote for each position. Who they individually voted for would depend upon the personal charisma of each candidate for the respective position. In addition, if one, once elected, proved to be too harsh on their charges or loss favor in other ways in the eyes of their men, they could just as easily and quickly be voted out. Apparently, Ardin Biggerstaff had whatever his company wanted in their chosen company commander. No village or town relating to “Judge atdkinson” can be located. Could this possibly be a reference to a farm owned by a Judge Atkinson? The “fs” in the term “a crofs” was especially challenging in the deciphering process. It was easily understood from the surrounding words that the phrase meant across or crossed, but the “f” simply made little sense, and in some instances the “s” was left off. Yet it became apparent in such other words as loss (lofs) and pressed (prefsed) that his “fs” meant “ss”. Most likely unmounted infantry. Although most of the Illinois militia, which Captain Biggerstaff was a member of, were mounted, some were not and were used to man various forts. This last paragraph was particularly difficult to decipher. I can only hope I translated it correctly, or at least within the gist of what Captain Biggerstaff meant. Biggerstaff, Arden. “A memberrandom of the Camppaign in the Year 1832 To The Mishigan Tarritory Against The Black Hawk.” 1832. 1902. Accessed, 7 July 2018, https://books.google.com/booksid=phOAAAAYAAJ&pg=PA16&lpg=PA16&dq=Ardin+Biggerstaff&source=bl&ots= odZRctfS6A&sig=WeC_W901dKt3Uqw1uFJk4cQspp4&hl=en&sa=X&ved=0ahUKEwiGmMatno7cAhXi0FQKHcgQDMkQ6AEIOjAE#v=onepage&q=Ardin%20Biggerstaff&f=false. Find a Grave. Accessed, 7 July 2018, https://www.findagrave.com/memorial/27230738/ardin-biggerstaff. Ford, James. “Re: 1832 Black Hawk War diary,” email, 2018. “Will of Arden Biggerstaff.” “The Yesterdays of Hamilton County, Illinois.” Accessed, 10 July 2018, http://www.carolyar.com/Illinois/Wills/BiggerstaffArden.htm. Last updated on 17 Jul 2018 . This page's Webmaster can be contacted at rdaniels26@cox.net.